By heavy sweater I don't mean clothing, I'm referring to your perspiration rate! Anyways, I was a pretty heavy sweater and because of this I'm going to share a few of the tips that has helped me over the years. Obviously the first thing to focus on if you perspire a lot if being properly hydrated well before starting your match. This is something you learn how to do better with practice. This was tough as a kid as I would get stitches pretty easily if I drank too much liquid prior to a match. One time during a 5 setter in university I was so dehydrated that I couldn't stand up straight because of the cramping in my stomach. Somehow I won the 4th game by shooting without being able to move, but fell short in the 5th in an extremely painful occurrence. It was frustrating because it was a match I would have and should have won if it were not for this pretty intense case of dehydration. Using electrolyte tabs and sports drinks can also be useful when you are sweating heavily. Although I don't quite understand why kids finish a bottle of gatorade before even stepping on court. Another key for me was having 3 or more racquets with relatively new grips on them. Even with top of the line grips in good shape on my racquets they would get soaked as the match went on which affected my control. For this reason I would switch racquets after every game. This means you also want to have the same strings, type and thickness of grip and model of racquet to change to. I would often wear a wristband on my racquet arm to help keep sweat from rolling down my arm and also to wipe sweat off of my face. For a couple of years I had longer hair and this caused me to sweat a little more and my goggles would fog up and get lots of sweat on them. For this reason I started wearing headbands or bandanas to help keep my eye guards clear. It's very tough to play well when your goggles are fogged up and have sweat droplets on them. Another key here is to make sure your shirt is cotton. 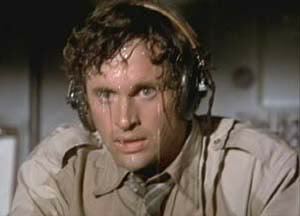 If I wore a dry-fit shirt it would just smear the sweat on my eye guards. A cotton shirt with a bit of a dry spot is much better at cleaning off your goggles. Switching shirts between some games was also something I did regularly. I never wanted to go back on court after a game with a shirt that was totally soaked. A wet shirt is heavier and won't be any use cleaning my eye guards. I've even heard of people having a spare pair of shoes and socks because their feet sweat so profusely. I also got into the habit of wiping my racquet hand on the sidewall or backless between every point. I tried every trick in the book to help keep my hands and gris dry and it was often still challenging. With all of these tips above I was able to minimize the impact of a slippery grip and bury goggles. It can make a big impact on the game if you can't hold your racquet properly or see clearly so remember hydration is not the only concern for us heavy sweaters. Preparation is not just about the physical, technical, tactical and mental training, it's also about learning how to avoid and deal with issues such as hydration and excess sweating. Keeping some extra clothing and electrolyte pills can make a big difference along with spare racquets and new grips. Don't put in all of this hard work only to let something like a sweaty grip or eye guards derail you from your best performance. Until October 3rd there is a 50% OFF sale on all orders over $100 on SeriousSquashShop.com. Enter the code nicks at checkout. You can now also pay with Bitcoin! Pick up your copies of Mastering Deception, The Secrets Of Solo Hitting and some Serious Squash merch for a great price! Is Deception Only For The Pros? I know it's been a long time since my last post, but I'm back. 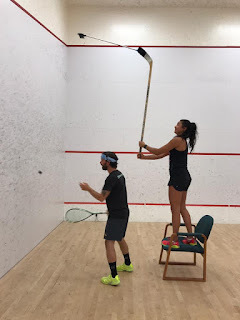 I've still been posting some tips and videos on social media so if you want to check out the latest tips and skill challenges feel free to follow Serious Squash on Instagram and Facebook. As a player for many years and now a coach for 10 I know the importance of understanding disguise and deception from early in the learning stages of squash. Of course we always start off by getting the grip right and learning how to just get the ball to the front wall and move back to the T, but after the very basics are understood I believe it's critical for any player with aspirations to play at a very high level to learn how to disguise their swing. We watch the pros on Squash TV and often don't even notice their disguised shot, only the odd taxi we marvel and wonder how in the world did they completely fool another top pro. At a certain level if you don't disguise your shot your opponent will simply be cheating on their T position and will be on your shot and applying pressure to you no matter how good the execution of your shot was. A few years back when I was working on my final Master's project I was designing an app for shot selection from the front of the court. My idea is that most players don't know what to do up there. Our opponent's are behind us and if we have too much time we normally think about it too much and hit a terrible shot, other times we panic and try and hit an outright winner, but we feel the pressure of our opponent breathing down our necks because we shape up for our shot so earlier and have decided to go for an all or nothing winner. The problem is, that most of us can't hit outright winners even while feeding ourselves in practice, let alone in the heat of competition. While I was working on this project I exchanged a few emails with Roger Flynn who is kind of the squash guru for decision making. At the time he was the head coach of Scottish Squash. He told me that he liked to use the term, coupling when he taught people disguise. That when you shape up for a shot it should look at least the same as 2 different shots. If we ever shape up for a shot which only has a single outcome we better make sure our opponent is out of position or be under lots of pressure and just trying to retrieve the ball. This coupling idea is something that must be used when you decide to hit straight or crosscourt length from the front or when you play an attacking boost or decide to crosscourt out of the back corners. If we telegraph our intention prior to hitting it we expose ourselves to a quick attack by our opponent. This is why I believe option drills are important. It's so critical to learn not only what is the right shot to play, but learn how to anticipate and both make it tougher for our opponent to read what we are about to do. I've seen and worked with players who are well accomplished, and are unable to make changes and 'couple' their swings after years and years of grooving very separate strokes for each shot. This is why I feel strongly about learning this part of squash earlier rather than later. I have always used deception and disguise in my games, and often times way too much. But I do know that played the right amount and executed properly it can make a fit player exhausted extremely quickly. The fact that squash racquets are so much lighter, and head light versus when I started playing it allows us to snap the ball and change direction at the last second and also rapidly increase or reduce racquet head speed. This has made squash much more exciting at attacking. If this is a topic that interests you I definitely recommend checking out the new Serious Squash film. It comes with a money back guarantee.